“In reality we are always between two times: that of the body and that of consciousness. Hence the distinction made in all other cultures between body and soul. The soul is first and above all, the locus of another time.” – John Berger, And Our Faces, My Heart, Brief as Photos. In the past, photography has been relentlessly cross-examined regarding its relationship to death. I will be the first to admit, the medium does function as an artefact, an anchor point as it were, from which all recent time can be decoded and our societies disseminated. If we were not living in an age of immediate communication, of digital words and symbols, the photograph, as it was used in the past, would be the only mode of conveying, a notable epoch of life. One can assume, because of our familiarity with what is ironically a timeless story telling medium, we can but will not choose to see photography as something beyond its frame. I sought a location of infinite scale and depth to help activate my photographs. Continuing along the vein of organics and humidity, acting as psychological stimulants, I became interested in exploring the philosophy of the forest. When you step inside a forest, you enter a space of ancestral time. These green giants grow, slowly, stretching out their branches, reaching for the sky. Their roots spread along the floor curving and moulding themselves around boulders and the tracks of the river. They embed themselves into an ever-growing lattice of rock, root and soil. A mossy coat covers them, slowly through time, into a deep, vast, magnificently verdant sea. Away from boundaries – the horizon distant – we feel prompted to admire the coexistence of such beings. It is the presence of the forest and the density of its nature, which arrests for us, the relentless progression of time. It is peculiar how forests have such an affect on us. In our mind’s eye they exist continually in the past. As Gaston Bachelard comments in The Poetics of Space, “why, in the reign of the imagination, there are no young forests”. Perhaps, it is the canopy of the trees that shelter us from gently falling light and the intoxication of time and duration. As temporal dimensions crumble, objectivity leaves us. We are found in a still, oneiric state, contemplating our own accumulation of experience. In Japan, followers of Shinto – an ancient and sacred religion ­– place a strong belief in Kami. Kami are essentially spirits, although this is a great simplification of the mythical power these beings possess. Human beings are incapable of forming a true understanding of their nature. Through diligently conducted religious and spiritual ceremonies, present day Japan connects through the Kami to their ancient past. There is a Japanese belief that Kami pervade every aspect of life. They live in the fabric of reality; rocks, trees, plants, waterfalls, even mountains contain Kami. Kodama are the spirits found in the forest, living in certain species of trees. They are the very being of the forest. Upon researching this extensive spiritual belief, it became evident to me that Japan had strong metaphysical potential and was an ideal site for my work. I concluded that the forest, found in Japan, was to be the epicentre of my psychological terrain: a perfect field in which to create photographs which would be open and closed at the same time, rendering themselves as “psychological transcendents”. In Aomori, my interest was drawn, with an almost overpowering urge, towards the colour blue. Rebecca Solnit mused in The Blue of Distance: “For many years, I have been moved by the blue at the far edge of what can be seen, that color of horizons, of remote mountain ranges, of anything far away. The color of that distance is the color of an emotion, the color of solitude and of desire, the color of there seen from here, the color of where you are not. 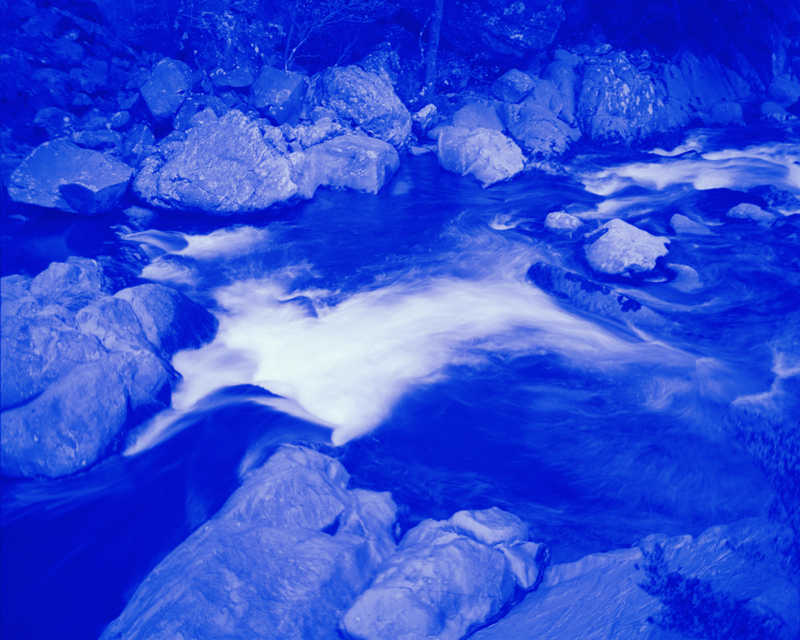 And the color of where you can never go” For Solnit, the blue world embodies distances we can never quite arrive in. The colour blue – formed through fluctuating atmospheric conditions – creates for her, and many others, a great immaterial and metaphorical plane. Yves Klein sought to annihilate conventional representation. As an artist of great conceptual foresight, he felt nothing he could ever paint would ever imbue the viewer, or himself, with the immensity of his experience. He famously mastered Judo in Japan then focused his attentions towards examining the limitless sky. Through his deep contemplation of the sky, he began plastering white canvases with a pure and mystical blue - Klein Blue. “Come with me into the void!” wrote Klein, “You who like me, dream / Of that wonderful void / That absolute love . . .” For Klein, that block, dense, immovable blue, was the only representation he would ever need. This was the only way he could convey pure experience. Hokusai, the famed Japanese woodblock printer, was also an admirer of blue. At a time when Japan was strictly sanctioned and foreign trading illegal, Hokusai successfully sourced Prussian Blue for his work. In the iconic Thirty-Six Views of Mount Fuji, the artist, somewhat obsessed with the capture of Mount Fuji, printed his first five depictions of the series entirely in blue shades. Hokusai was said to be emulating the sight of dawn around Mount Fuji. Whilst in Japan, I photographed exclusively on medium format analog film. Experimentally, I sourced blue glass from a church window, which was then cut to size to fit the filter holder of my camera. I exposed my film directly to the blue world. Glass, which is normally a material of separation, is employed directly in my process to unite both medium and idea. These photographs bring Solnit’s blue of distance near, into the world of the forest; they are by process, forever blue. 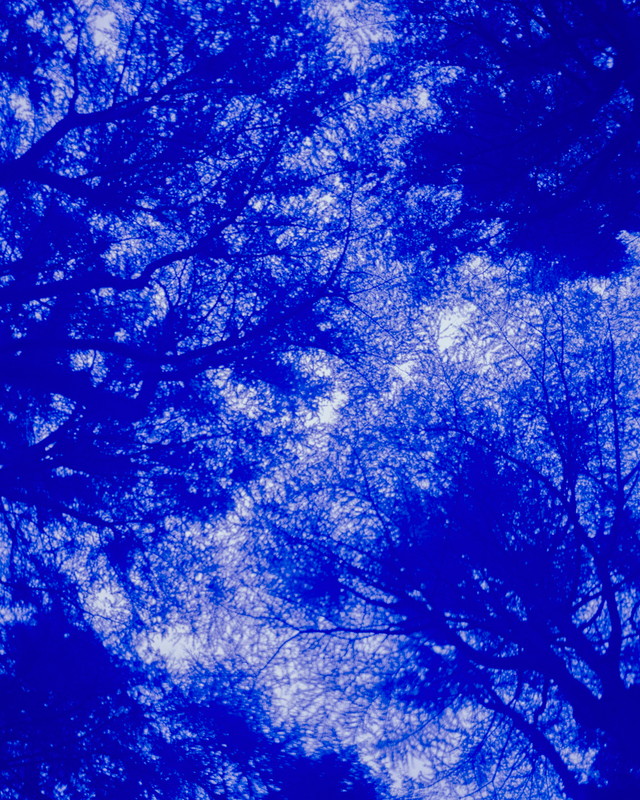 Aomori, “blue forest” in Japanese, is a synthesis of these two existential ideas. By combing these phenomenologically charged subjects, I am creating a place of high intensity, a place that exudes a life force, a place of being. Through these coalescing notions, it is my intent that these photographs can reach a far higher level of engagement than conventional photographs. With stillness you feel a want, a desire, amongst the pictures. You are encouraged to invest them with inner space, render yourself opaque, they are no more blue than I and you. They are too, in search of their soul. Alexander Mourant's AOMORI exhibition runs 2-4 February 2018 at Shop 11, The Old Truman Brewery E1 6QR. It is supported by Free Range, Metro Imaging, ArtHouse Jersey and uses public funding by the National Lottery through Arts Council England. Carl Bigmore – There It Is. Take It.